When it comes to local towns, the borough of North Apollo at age 86 is really a sprightly young whippersnapper compared to the wizened, wise, slightly eccentric but always beloved 200-year-old grandpappy of Apollo PA. Despite its youth, North Apollo has some stately old homes built decades before the borough was incorporated. And some “newcomers” built during the Roaring 20s are also architectural lookers. In fact, a dozen North Apollo houses were identified in an old county report as having some sort of historical/architectural significance. Many of the homeowners may have no clue that their houses were featured in this 35-year-old government survey, or that their residence is (or was) considered a sterling example of a certain type of local architecture. Ever Heard of Luxemburg Heights? After the 1890s, a community known as Luxemburg Heights was mapped out on the northern remains of Simon Truby’s farm. Today that community is located in the southwest corner of North Apollo borough. As you may already know if you’ve been reading the Truby Farmhouse Blog, North Apollo’s Pegtown was also laid out on Simon Truby’s farmland. The Sanborn Fire Insurance map below from 1915 shows the layout and homes in the Luxemburg Heights community 100 years ago. All of the streets and residential lots on this map, as far to the right as N 16th Street, used to be Simon Truby’s farmland. The oval fairgrounds near the bottom of the map and the lands below had belonged to Simon’s farmer friend George Washington Hildebrand. 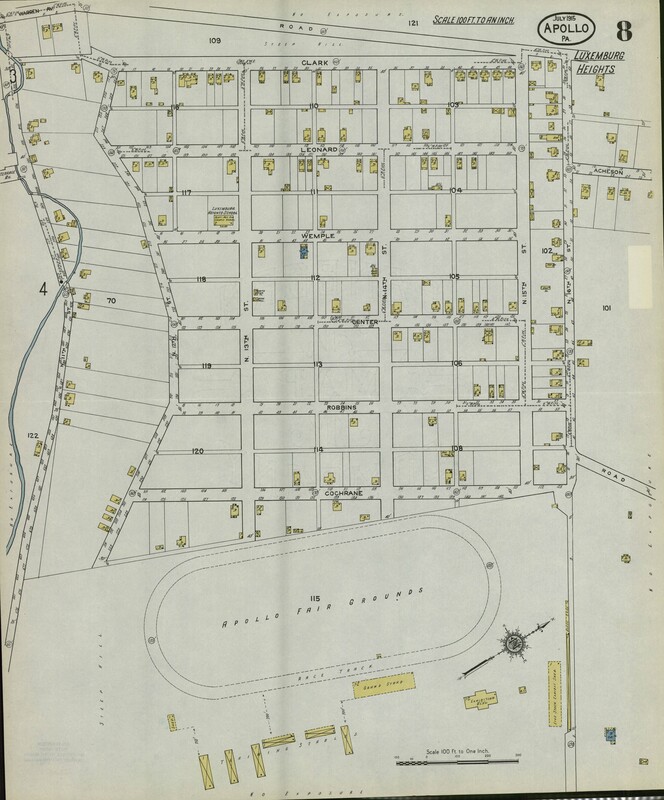 1915 map of Luxemburg Heights, which today is at the southwestern end of North Apollo borough. This residential community, above the oval Apollo Fairgrounds, was mapped out on Simon Truby’s farmland several years after his death in 1886. Can you find your home – or a friend’s home – on this map? Sanborn Fire Insurance Map. If you read my earlier Truby Farmhouse articles, you may already know about Armstrong County’s 1980-81 Historic Sites Survey, in which the county hired architectural historians to visit and photograph dozens of locations county-wide. They wrote up a 1- or 2-page report for each property. Most people didn’t realize their house(s) had been included in this survey. In most cases, the experts simply viewed the houses from the outside, without knocking on doors, and wrote up their very interesting but brief reports. Below are most of the 12 North Apollo homes described in the 1980-81 Historic Sites Survey, starting with the oldest houses still standing. About half of these dwellings were built on Simon Truby’s old farm. All but 1 or 2 of the 12 listed homes still exist. There were 3 dwellings I couldn’t find–on Spring St, Moore Ave, & Hickory Nut Road–but I’ll bet at least the Moore Ave house is still around. Can you help? The 3 un-found houses are highlighted in Yellow below. As described in an earlier post, I-Houses & 4-Over-4 houses were common in Western Pennsylvania in the late 1700s and early 1800s. I-Houses have 2 rooms on each floor with a central hallway. 4-Over-4 houses are 2 rooms wide and 2 rooms deep, with a central hallway that runs from the front to the back of the house. Three I-houses and one 4-Over-4 in North Apollo–all likely built in the late 1800s–were included in the County’s 1980-81 Historic Sites Survey Report. Kirkman I-House on Grove Street, built c. 1886. Photo by Vicki Contie, May 2016. The gorgeous Kirkman I-House on Grove Street–see the large photo at the very top of this article–was built in 1886, according to tax assessment records. It’s one of North Apollo’s oldest remaining farmhouses. Special thank you to Vivian Shaeffer, whose grandparents Nellie (Boarts) and Thomas H. Kirkman had long lived in this house, having purchased it in 1956 from the Noel family. Over Memorial Day weekend, Vivian connected me with her mom, Carole Kennedy, who co-owns the house today. And Carole was kind enough to give us a tour of their lovely family home and surrounding land. The 1980-81 Historic Sites Survey notes that this vernacular I-house has 2 stories, 5 bays (a bay is a window or door), and a frame construction. A front-facing gable interrupts the roofline. A rear wing—added later gives the building a distinctive T-shape. In the 1896 map a few paragraphs below, a blue arrow points to a drawing of this treasure of a house. Carole says that this house was originally built by a Hildebrand. I’m still researching the details as to which Hildebrand, as the original landowner—George Washington Hildebrand—had died before this house was built in 1886. I suspect the house may have been built by one of George’s sons. More to come. The Reefer House of North Apollo is another grand old I-House—this one built in 1892, according to tax assessments. Located near PA Route 66 at Clark Ave and N 15th Street, this 2-story 3-bay dwelling has a gabled roof and 2 exterior brick chimneys. Reefer I-House at the intersection of Clark & N 15th Street, built in 1892, was 1 of 5 similar houses on this block. All 5 of these houses were built on Simon Truby’s farmland. Photo by Vick Contie, May 2016. “The [Reefer house] is one of a row of 5 houses of identical design, built as single-family dwellings during the late 19th Century. All of these buildings appear on a 1896 panoramic map of the Apollo area. Here’s a close-up of a portion of the 1896 panoramic map described above, featuring today’s North Apollo. The 5 similar houses are circled and labeled in red, with the Reefer house at the far left. The Kirkman I-House is labeled with a blue arrow. Click on the map to open up a larger version, or click here. Close-up portion of the 1896 Panoramic map of Apollo by Fowler & Moyer, focusing on what today is known as North Apollo. Pegtown at far left; Reefer I-House & 4 similar houses circled in red; Kirkman I-House at blue arrow. And here’s a close-up of the 1915 Sanborn map showing the same 5 houses circled in red. The Reefer house is at the far right; the 2nd house from the right no longer exists; and I’m not sure if the other 3 at left remain standing. Click for a larger version. UPDATE from June 2016: Reader Dawn Henry Bentley commented that the house that was NEXT to the Reefer house had belonged to her great-grandparents, T William & Mary Louanna McPhilliamy; that house is no longer standing. Close-up of the 1915 Sanborn map of Luxemburg Heights, today part of North Apollo. The 5 houses circled were similarly built in the early 1890s. The Reefer I-House, at far right, still stands at the corner of Clark and N. 15th Street. I couldn’t find the Cravener house, supposedly located at 507 Spring Street, which is the 3rd North Apollo I-house listed in the Historic Sites report. The report includes a small map showing that the house is near the intersection of Spring & Oakwood Streets (see below). But I couldn’t find a 2-story I-house at that location. If you have any knowledge of this old I house or tidbits to share, please add a Comment to the end of this article. It’d be fun to learn more about the history of this apparently now-gone home. Hines-Sanders 4-Over-4 house on Hickory Nut Road. The blue Hines-Sanders house at 1722 Hickory Nut Road, built between 1880 & 1899, is the only 4-over-4 type house in North Apollo that’s listed in the 1980-81 Historic Sites report. Today that house is owned by the Barto family. Read more about this house and 4-Over-4 construction in an earlier blog post. The Historic Sites Survey cited one Upright & Wing home in North Apollo, located at 1602 Acheson Ave, at the corner of Acheson & N. 16th Street. Known as the Fouse house, built in 1908, this home is a 2-story Upright & Wing, which is a variation on the I-house design, but with a 1- or 2-story wing added on. Here’s Wikipedia’s entry on Upright-and-Wing folk-type architecture. By the way, this Acheson Ave house is currently on the market! Cubic-type houses, also known as American Foursquare, were locally popular in the 1920s, according to Armstrong County’s 1980-81 Historic Sites Survey. “This decade marked the beginning of the automobile era in America, and cubic houses were the first style to have attached garages. Many houses of this style were built in Armstrong County at this time,” the report states. 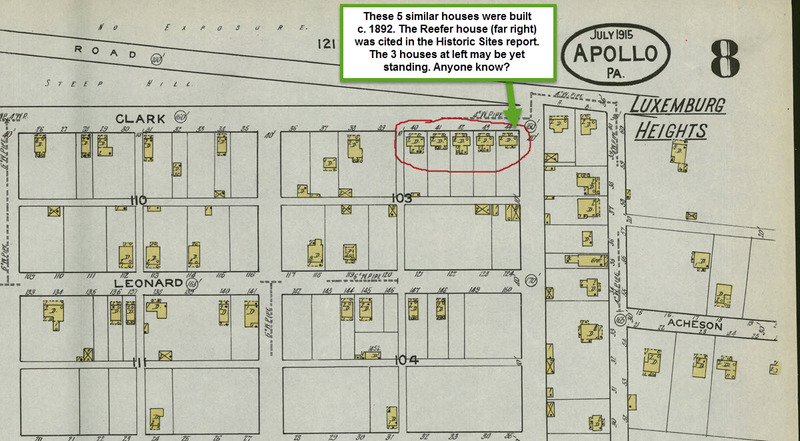 In fact, 9 Cubic-type houses were constructed in North Apollo during the 1920s. Two of these were recognized in the county’s Historic Sites Survey report. Foursquare houses are a roughly cubic, 2-story structures, usually with a pyramidal roof that has 1 or more dormers. Each floor generally has 4 square-shaped rooms with a central hallway. This house type originated in the U.S. in the 1890s and remained popular throughout the 1930s. They’re especially good for giving maximal living space on small residential lots. The brick Held house at 1324 Leonard Ave, at the corner of Leonard & N 14th St, is an “excellent example of the Cubic style,” the report notes. It was built in 1927, according to tax assessment records. Built in 1927, the Held house is a noteworthy example of Cubic or Foursquare-type architecture. Located at the corner of Leonard & N 14th St. This house sits on land that was once part of Simon Truby’s farm. Photo by Vicki Contie, May 2016. This dwelling, built as a single-family residence, helped house the influx of the population to this area, which was the most populous section of Kiskiminetas Township in the 1920s. Citizen organization led to incorporation of North Apollo Borough in 1930, three years after this house was built. There are several cubic homes in the immediate vicinity, but this was selected for its unaltered appearance and above average conditions. The original owners occupy the house. Another lovely Cubic house, known in 1980 as the Davis house, is located at 1202 Cochrane Ave. It was built in 1928. Today the house is owned by the Rodgers family. Cubic style, or foursquare, architecture at 1202 Cochrane Ave, built in 1928. This house sits on land that was once part of Simon Truby’s farm. Photo by Vicki Contie, May 2016. The county’s Historic Sites Survey recognized the following 3 bungalow-style houses in North Apollo. Bungalows are typically 1-and-a-half stories. Read more about bungalow architecture at Apollo’s Historic House Styles: Bungalow & Upright-and-Wing. The Kuhns house at 1307 Wemple Ave is a stucco & wood Bungalow-style house built in 1922. Photo by Vicki Contie, May 2016. Andrews house, a bungalow style built in 1926, at 831 N 16th Street. Download the PDF of the Andrews house site survey report. Shaffer house, built in 1926 and located at 1703 Wilson Ave near N 17th Street. In 1980, the house was owned by a younger generation of the original family. How is a bungaloid house different from a bungalow? I have no clue. But the Shriver house listed at 802 Moore Ave is classified as a Bungaloid, according to the county’s 1980-81 Historic Sites Survey report. However, I couldn’t find this house. A portion of the report is below and may provide some clues, including a description of house features. Can you shed any light on the location of this house? Click the image to open a larger version. The Apollo Steel Company brought prosperity and population growth to the Apollo area when it began operations in 1913. In 1921, the company had several stucco-covered, single-family, bungalow-style houses built on Moore Ave in North Apollo. [The Shriver house] was selected for its unaltered appearance and grey color, although various pastel shades were used for others on the street. This area of the borough was once called Allison Lane, before it was combined with Pegtown and Luxemborg Heights sections to form North Apollo Borough in 1930. Two waves of residential construction are apparent in the Allison Lane area, the first in the 1920s when this company house was built, and the second later, in the 1950s. HAPPY NEWS! A long-time resident of the Shriver house at 802 Moore Ave has sent the photo of Shriver house. The photo is a several years old. A lovely house! In addition, an email from Lawana & Phil Murphy of North Apollo helped clear up some confusion over the street addresses, which have apparently changed since the Armstrong County Historic Site Survey was completed in the 1980s. Today, 802 Moore Ave is 1724 Moore. 802 Moore Ave (today the address is 1724 Moore), near the corner of 18th Street, North Apollo. Photo courtesy of John Shriver, whose parents purchased the house for $3,600 in 1944, when John was age 4. His parents John & Eleanor Shriver continued to live here for nearly 5 decades. The house was sold after Eleanor’s death in 1991. The Historic Sites Survey says that the Cockran house on Hickory Nut Road, built c. 1900, is a vernacular style structure that’s unique to North Apollo’s built environment. “The residence is an example of an attempt by the common man to integrate popular stylistic features into a less expensive dwelling,” the county’s architectural experts wrote. Sad to say, I can’t seem to find this house! The portion of the report pasted in below may provide some clues. If you can figure out where this house is located, please let us all know by commenting at the end of the article. UPDATE in June 2016: Readers Debbie Kloc and Milli Cook note that the Earlie Cockran house was torn down years ago. See their Comments at the end of the article for more details. Subscribe to the Truby Farmhouse blog to receive emails whenever new articles are posted. Help to preserve Apollo’s history by making a donation to the Apollo Area Historical Society at https://apollopahistory.wordpress.com/donate/ . And stop by their museum on N. 2nd Street to see their displays, neat old photos, & hot Apollo merch for sale, including the 1896 panoramic map of Apollo. Come check out Apollo’s History Walk along Roaring Run Trail on Sun July 3, from 4-6pm (I think). I’ll have a table with info about Apollo’s architectural styles and also the Truby farm, family, and farmhouse. Plus, you can visit other tables as you stroll along through Apollo’s 200 years of history. Be there or be square! While researching the history of Simon Truby’s farmhouse in Apollo, PA, I happened upon an architectural survey of historic buildings in Apollo and other towns in Armstrong County. This Historic Sites Survey was conducted more than 3 decades ago, in 1980 and 1981. It’s unclear what criteria the surveyors used to choose the 29 homes and other buildings in their report on Apollo Borough. They seemed to overlook a few beauties, including the Damico home at the corner of N. 9th Street and Terrace Ave, built circa 1895 by Frank W. Jackson, son of Apollo’s General Samuel McCartney Jackson and uncle of Hollywood actor Jimmy Stewart. Still, the historic sites surveyors made some interesting choices that could cause you to take a 2nd look at homes that might initially seem unremarkable. If you look carefully enough, every home or building or structure has a story to tell or raises questions to investigate. You can read in earlier blog posts an overview of the 1980-81 survey, with an emphasis on Terrace Ave (Apollo & the Historic Sites Survey of 1980-81), and describing Apollo & North Apollo’s I-house and 4-over-4 style homes (Apollo’s “folk-type” architecture). Sad to say, some of the old houses included in the site survey report have since fallen into disrepair. Here we’ll take a look at two other historic vernacular-type houses in our community: Bungalow and Upright & Wing. All the houses described below were included in the 1980-81 survey, and I’ve included downloadable PDFs of the surveyor’s original reports, if you’re interested. Bungalows are generally considered to be 1- or 1½-story houses with a simple design, low sloping roof, and a front porch. This type of house design originated in the Bengal region of South Asia–the word “bungalow” means “house in the Bengal style”–and it quickly gained popularity around the world during the early 1900s. Read more about bungalows here http://www.antiquehome.org/Architectural-Style/bungalow.htm. Bungalow-style architecture seemed to be all the rage in Apollo during the roaring 20s and beyond. In fact, at least 25 bungalows were built in Apollo Borough in the 1920s and 1930s, according to the Historic Sites Survey report. The report notes that the Buyers house at 320 N. Third Street in Apollo is a notable example of bungalow-style architecture in the borough. The house was built circa 1930. Bungalow-style house at 320 North 3rd Street in Apollo. The style became increasingly popular in Apollo during the 1920s and 1930s. Photo by Vicki Contie, March 2016. The historic surveyors also described four bungalow-style houses in North Apollo Borough. However, I was unable to identify these buildings the last time I was back home in Pennsylvania. The street numbers in the Historic Sites Report did not seem to match the street numbers on the dwellings in North Apollo. If you can help me identify the houses listed below, or send me photos of them, I’d be most grateful! I’ll include more info about these houses and acknowledge your help in a future blog post. Shriver house, 802 Moore Ave, North Apollo – A bungaloid-style house made of stucco/wood and built circa 1920. Shaffer house, 823 Wilson Ave, NA – A brick/tile bungalow built circa 1826. Kuhns house, 352 Wemple Ave, NA – A bungalow built in 1922 of stucco/wood. Andrews house, 1693 N 16th Street, NA – a brick bungalow built in 1926. Download the PDF of the Andrews house site survey report. Can you help to identify or photograph the North Apollo bungalows at the addresses listed above? The Historic Sites report notes that many of North Apollo’s bungalows were built during a period of prosperity and population growth after the Apollo Steel Company began operations in 1913. In fact, the company built many single-family bungalow houses along Moore Ave and elsewhere in North Apollo beginning in 1921. Upright-and-Wing-type dwellings were popular in western Pennsylvania during the late 1800s, according to the Historic Sites Survey report. This type of house generally has a 2-story gabled “upright” section attached to a 1- or 2-story wing. Here’s Wikipedia’s entry on Upright-and-Wing folk-type architecture. The 1980-81 report says that the Womeldorf house at 605 N Fourth Street is a unique variation on the Upright-and-Wing. Evidence hints that the house may have been built between 1876 and 1896, during a period when the burgeoning railroad and local steel industries led to a boost in the local population. Of note is the 1 1/2-story mansard-roofed section in the middle of the L-shaped floorplan. It appears that the house’s distinctive original windows have been replaced since the 1980-81 report was written. Note the original fieldstones at the base of the upright section. The Womeldorf house at 605 N.Fourth Street in Apollo, PA, is a unique example of Upright-and-Wing folk-type architecture. Photo by Vicki Contie, March 2016. Another Upright-and-Wing cited in the 1980-81 report is located at 416 N. Fourth Street. Known as the Clemenson house, this home was built circa 1870. The report notes that the gabled roof features cornice returns, and that the back porch retains its original wood eave trim, but the original front porch features had been replaced. The Clemenson house at 416 N. Fourth Street, built circa 1870, is another example of an Upright-and-Wing dwelling. Photo by Vicki Contie, March 2016. Upright-and-Wing in North Apollo – A little help please? The Historic Sites Survey cited one Upright-and-Wing home in North Apollo, located at 830 Acheson Ave. Known as the Fouse house, this home is apparently at the corner of Acheson Ave and North 16th Street. Again, I was not able to locate that North Apollo home. If you can provide information or a photo of the Fouse house, I’d be very appreciative. The Fouse house, according to the survey report, is a 2-story Upright-and-Wing with a slate-covered multi-gable roof interrupted by one interior brick chimney, and with simple Tuscan-order columns that support the plain establature and roof of the wrap-around front portico. A one-story wing section and porch abut the rear of the house. I’ve been gradually building this interactive map of homes and other buildings that were described in the 1980-81 Armstrong County Historic Sites Survey. Please visit & click around to see images and brief descriptions of the buildings. I’d like to add North Apollo homes to the map as well, but I’d be grateful for some assistance from people familiar with the area. Beneath this image, please see a “wish list” of North Apollo homes I’d like to identify or have photos of. Click on the map to open a larger interactive version. I’ll add more buildings to the map as time allows. North Apollo Wish List: The following homes were listed in the Historic Sites Survey, but I haven’t been able to find them nor photograph them based on the addresses listed in the historic survey report. If you can help, please let me know! I’d like to add more NA homes to the interactive map. Davis house, 678 Cochrane Ave – 2-story, 2-bay Cubic-style wood house built circa 1928. Held house, 230 Leonard Ave – Brick Cubic-style house built in 1927. Reefer house, PA Route 66 & 15th Street – Wood I-house with a back wing section resulting in a T-shaped plan. A 2-story 3-bay dwelling with a gabled roof and 2 exterior brick chimneys. Built 1892. Cravener house, 507 Spring Street – Wood I-house, built circa 1900, with its gabled end facing the street and one central brick chimney that interrupts the slate-covered gabled roof and a 2nd brick chimney, located at the exterior gable end. Kirkman house, Grove Street – Built in 1886, this structure is probably one of North Apollo’s earliest remaining farmhouses. It’s a vernacular I-house with 2 stories, 5 bays, and a frame construction. A front-facing gable interrupts the roofline. Please visit the website’s homepage at trubyfarmhouseapollopa.wordpress.com and sign up to receive email notices of new blog articles. Up next: The Farmer Takes a Wife: Simon Truby, his wives, and his children. Thanks for reading! 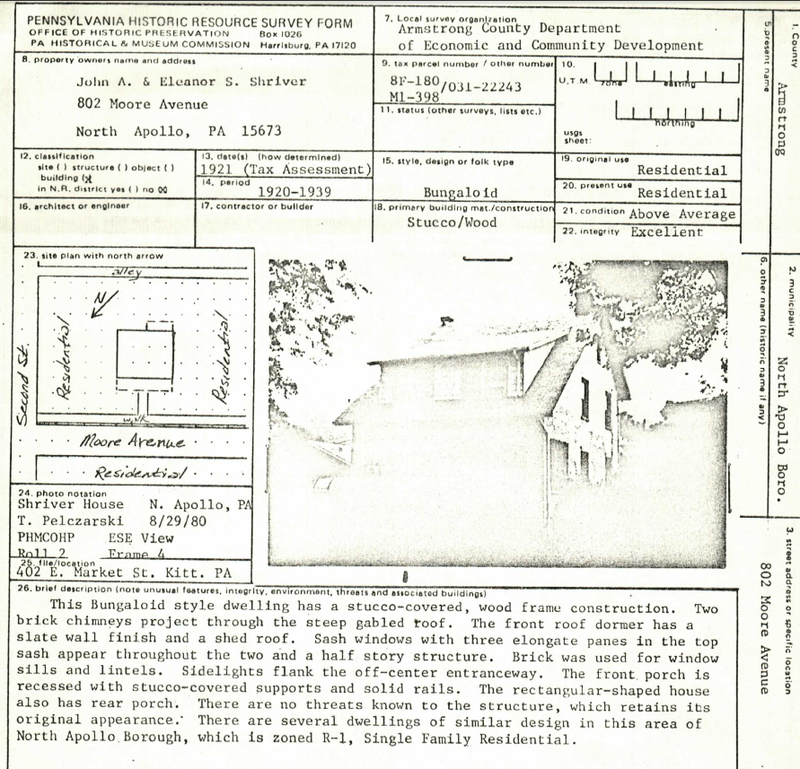 As mentioned in my last blog post, the Armstrong County Historic Sites Survey of 1980-81 noted that several of Apollo’s historic homes have a “folk type” or “vernacular” architecture. This refers to mostly modest homes built with local materials in traditional, familiar styles, without the assistance of professional architects. In a future blog post I’ll write about a few other folk-type houses in Apollo, such as bungalow and upright & wing. But for now we’ll focus on the I-House and 4-Over-4 house types. Both have a center hallway with symmetrical rooms on each side. Illustration of an I-House, which has 2 rooms on each floor separated by a center hallway. Courtesy of the Missouri Folklore Society. The folk-type I-House, common in the 18th century in the U.S., is a 2-story house featuring a center hallway/staircase with a single room on either side. This type of house—sometimes called a Georgian I-House—is just one room deep with 4 rooms total. Here’s a nice overview of rural I-Houses in America. The brick house at 323 First Street in Apollo is possibly the oldest surviving I-House in the borough. Because it’s only 1 room deep, you can see straight through the house at the upper left window in the photo below. The 5-bay (5-window) brick I-House at 323 First Street, Apollo PA, built circa 1850. Since it’s only 1-room deep, you can see straight through the upper left window to the other side of the house. Photo by Vicki Contie, August 2015. The Historic sites Survey report notes that the home’s one chimney projects from the gabled roof, and the centrally placed entranceway has multi-paned transom and side windows. Later additions include the front and back porches and a weatherboard-sided rear wing, which gives the building an ell-shape. Dr. Thomas J. Henry’s History of Apollo, published in 1916, says that this brick house on First Street was built by Dr. William McCullough. In fact, a deed search shows that Dr. William P. McCullough never owned that property. Rather, the lot was owned by McCullough’s brother, Dr. Thomas C McCulloch, from 1850 to 1860. I’ll write a future blog post about the history of that property, including the mysterious fact that brothers William and Thomas McCullough/McCulloch had differently spelled last names! This lot had several owners before McCulloch, including Robert Carnahan, who owned the property from 1817 to 1829. If indeed Dr. William McCullough built that brick house on his brother’s property, the structure was likely erected sometime during the 1850s. If you cross over First Street from the McCullough house and walk a little down the hill toward the bridge, you’ll come to another I-House cited in the 1980-81 Historic Sites Survey: the Speer house at 318 First Street. This wood-frame house was likely built between 1880 and 1889. Another historic I-house, the Speer house is at 318 First Street, Apollo, PA. Photo by Vicki Contie, March 2016. The Reefer house at 420 N. Fourth Street is an I-House that looks similar to (but simpler than) the Speer house above. The 2-doored Reefer house, built circa 1885, has been maintained since construction as a 2-family dwelling. Photo by Vicki Contie, March 2016. 507 Spring Street, the Cravener house, built circa 1900. Grove Street, the Kirkman house, build circa 1886. Route 66 & 15th Street, the Reefer house, built circa 1892. If you can shed light on any of these North Apollo houses, please let me know! The 4-Over-4 folk-type house was built throughout Western Pennsylvania in the 19th century, according to the the 1980-81 Historic Sites Survey. Like the I-house, the 4-Over-4 house has a central hallway. But as its name implies, a 4-Over-4 house is 2 rooms wide and 2 rooms deep, with the 2nd floor rooms and hallway directly over the first-floor rooms & hallway. Simon Truby’s 4-Over-4 farmhouse at 708 Terrace Ave in Apollo is one of the oldest surviving houses in Apollo borough. This 8-room brick house was likely built after 1843, the year Simon Truby purchased nearly 160 acres of land from Dr. James R. Speer and his wife Hettie of Pittsburgh (for details, see Start with a Dot, Then Follow the Deeds). Since the Truby house was built long before Terrace Avenue existed, the 5-bay front of the house faced westward toward the Kiskiminitas River. The current 3-bay front of the house that faces Terrace Avenue used to be the back of the house. The 5-bay “front” of the Truby farmhouse, circa 1890 (left) and today. When Terrace Avenue was extended to this part of town around the turn of the century, the front of the house became the back. A brick pantry and garage were added to the former “front” of the house sometime before 1950 (right). Left photo courtesy of Barb Aitchison. Right photo by Vicki Contie, 2014. The 3-bay “front” of the Truby farmhouse, facing Terrace Avenue, used to be the back of the house. The people conducting the 1980-81 Historic Sites Sites Survey were not aware of the original 5-bay facade on the other side. Photo from the Armstrong County Tax Office, 1995. The 1980-81 Historic Sites report notes that the Truby house is one of Apollo borough’s few remaining buildings from the 1840-1859 period, and the “4-over-4 design is easily recognizable. The report mistakenly refers to the house as a “smaller 3-bay version of the type which more commonly has 5-bays.” The historians apparently were not aware that the original front of the house does indeed have 5 bays. Although the former front of the house is now covered by a brick pantry and garage, and nearly all of the 1/1 original sash windows were replaced in the 1990s, the original front door and two lower 1/1 sash windows remain intact within the added-on pantry. Download the 2-page PDF of the Historic Sites Survey report for the Truby/Contie house at 708 Terrace Ave – I couldn’t help but add my own red-pen edits to this document to correct the report’s errors. The Toland house at 500 N. Fourth Street was “the best example of [a 4-Over-4 type house] in the Apollo borough,” according to the 1980-81 Historic Sites Survey report. Photo by Vicki Contie, March 2016. The Toland house at 500 N. Fourth Street in Apollo PA was “the best example of [a 4-Over-4 type house] in the Apollo borough,” and “the original 4-Over-4 design of this vernacular house is easily recognizable,” according to the 1980-81 Historic Sites Survey report. The report further notes that the property owner’s name appears on the 1876 Atlas Map is “S. McBryar,” and that the home was likely built between 1860 and 1876. It appears that the original weatherboard wall finish has been replaced by aluminum siding since the 1980-81 survey was conducted. Download the 1-page PDF of the Sites Survey report for the Toland house at 500 N. Fourth Street. The Hines Sanders house on Hickory Nut Road in North Apollo, built circa 1880-1899, is a vernacular 4-Over-4 style structure with an expanded form due to the addition of 4 wings, resulting in an irregular shaped plan. Photo by Vicki Contie, March 2016. An additional 4-Over-4 type house — this one in North Apollo — is the blue Hines/Sanders house on Hickory Nut Road; a larger version of this photo appears at the very top of this blog post. Built between1880 and 1899, this was originally a 3-bay house with a gabled roof, one brick central chimney, and an off-center front-facing gable that interrupts the roofline. Several additions have changed the overall structure of the home. 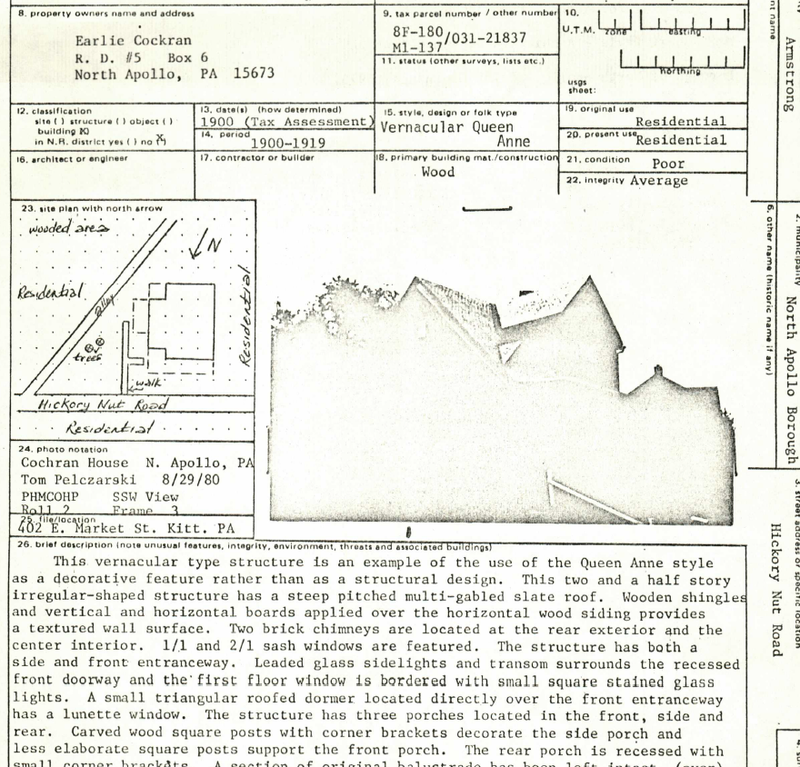 The Burkett family is believed to be the original owner of this single-family dwelling, the report notes. Download the 2-page PDF of the Sites Survey report for the Hines/Sanders house on Hickory Nut Road in North Apollo. And so concludes this overview of the historic I-houses and 4-Over-4 type houses in Apollo, as cited by the county’s Historic Sites Survey more than 30 years ago. As always, comments, suggestions, and questions much appreciated! Coming up, a report on Simon Truby’s farm and the peaches, potatoes, milk, butter, wool, and other stuff he grew/made right here in Apollo borough and in North Apollo as well.